1. 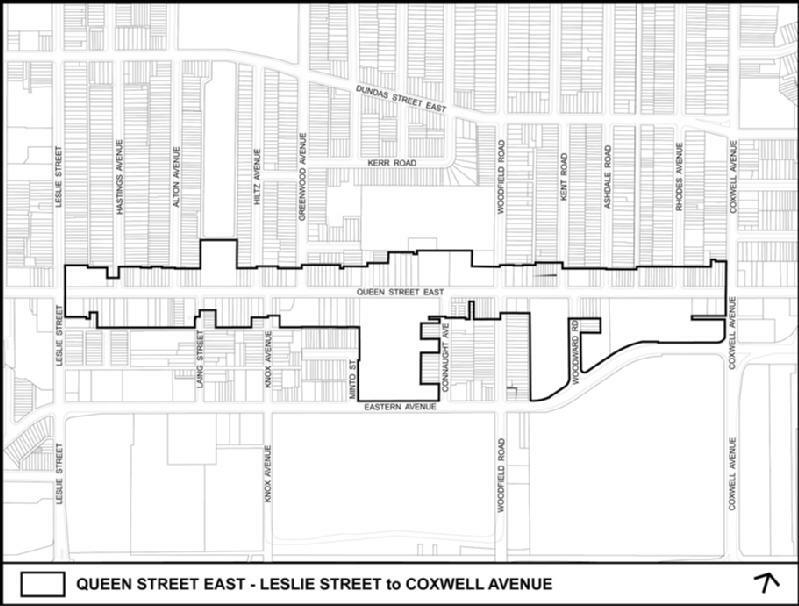 City Council amend the Official Plan, for the lands fronting on Queen Street East between Leslie Street and Coxwell Avenue substantially in accordance with the draft Official Plan Amendment attached as Attachment 4 to the report (December 15, 2015) from the Director, Community Planning, Toronto and East York District. 2. City Council adopt the Urban Design Guidelines attached as Attachment 5 to the report (December 15, 2015) from the Director, Community Planning, Toronto and East York District. 3. City Council request the Senior Manager, Heritage Preservation Services, City Planning to research and evaluate properties on Queen Street East in the Ashbridge Precinct, located between Leslie Street to Coxwell Avenue, for inclusion on the City’s Heritage Register. 4. City Council authorize the City Solicitor to make such stylistic and technical changes to the draft Official Plan Amendment as may be required. The city sought community input about design guidelines for Queen East through our neighbourhood. 1327 to 1339 Queen Street East development proposal — follow this from a community perspective on East Toronto Community Coalition. City of Toronto Construction Information – click on Ward 32 or Ward 30.
which includes the southern part of the Ashbridge’s neighbourhood as well as points east (Beaches, “upper” Beaches). See also: Ward 32 construction projects and park improvements on Councillor Mary-Margaret McMahon’s website. Leslie Barns (a.k.a. Ashbridge’s Bay TTC facility) which is also in Ward 32. Ashbridge’s Bay water treatment plant plans and environmental assessment. Ashbridge’s Bay / Coatsworth Cut plans by conservation authority to decrease the amount of silt building up in Coastworth Cut (south end of Ashbridge’s Bay). Sand from the Scarborough Bluffs is still moving west to this point of the lake. Map of ash tree problems in Ward 32 on Councillor McMahon’s site. which includes the northern part of the Ashbridge’s neighbourhood (Ashdale), Monarch Park area and points west to the Don River (Riverdale, Riverside, Leslieville). I don’t see a map through Paula Fletcher’s site, but here is her “news” page. See also: Leslie Spit plans. a.k.a. Tommy Thompson Park.